“RABBIT TAIL CUTE” welcome the new member of the Wolperdinger series. Like WINGS OF CUTE, FLUFFY DOG CUTE and their first born sister GODDESSE OF CUTE this creature got to life by doing a collage in photoshop as first step. Stencil (pink body and green eyes) and screen print (black) gets the image on thick paper. the finishing move is yarn embroided for the beams from the eyes and horns. 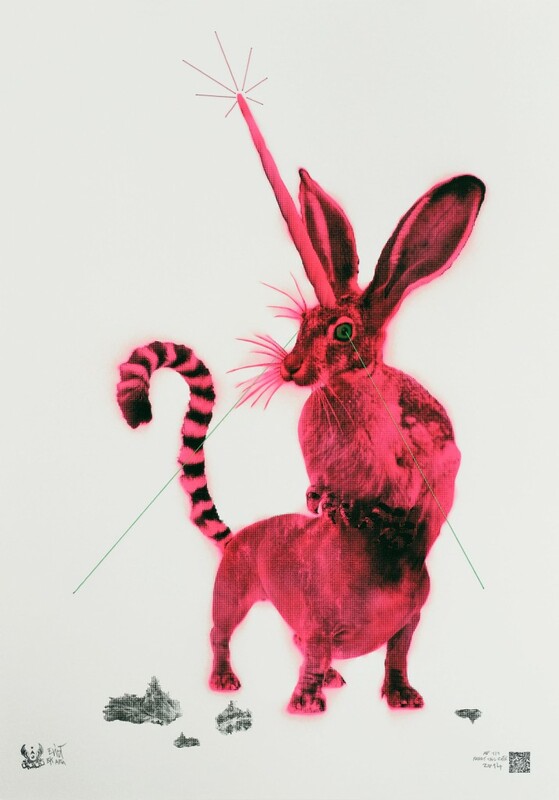 size is 100×70 cm – edition of 14 + 1 AP – made in Berlin 2014. This one like the other Wolperdingers is sold out – they always sell out very fast. This is why the next Wolperdinger will be created on a much better, fine museum quality paper and has a slightly higher price tag.